Gumbo is a staple of New Orleans cuisine, and with this recipe, even vegetarians and vegans can enjoy this classic dish. 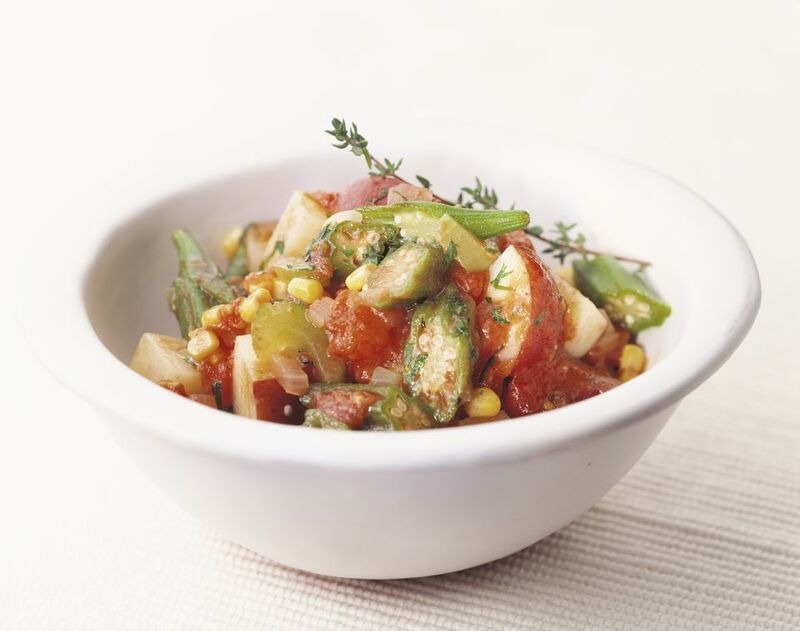 Like traditional gumbo, this vegetarian version includes the requisite celery, onions, bell peppers, tomatoes, and okra, making this a Creole-style or Louisiana vegetarian gumbo rather than a Cajun one (which omits the tomatoes). Gumbo isn't traditionally made vegetarian, so there's not really a wrong or a right way to make it. The recipe does call for filé powder (made from the sassafras tree) for seasoning, and though it's difficult to find in mainstream grocery stores, there's not really a good substitute. You can omit it without too much trouble and just add a touch more thyme and salt, and maybe also a touch of something savory and neutral to add flavor (like garlic powder, celery seed, or a dash of a Creole seasoning blend if you have one). If you need it to be gluten-free, just be sure to use a gluten-free vegetable broth or substitute water instead. Sauté the onion, bell pepper, celery and garlic in olive oil over medium heat in the largest saucepan or soup pot you have. Allow this mixture to cook for about 5 minutes. Next, carefully add the water and vegetable broth and bring the mixture to a low simmer, then add the tomatoes, sliced okra, sliced zucchini, thyme, filé powder, salt, pepper, and Tabasco, stirring to combine. Cover the pot partially and cook for 30 minutes, stirring occasionally. Be careful not to overcook. Serve generous portions of your vegetable gumbo over pre-cooked plain steamed white or brown rice, or serve your vegetarian gumbo over quinoa for a little protein boost.